Chris Froome bounces his way up a steep dirt road in the Colombian countryside. He muscles his Pinarello Bolide time trial bike over rocks and gravel, while the mountains of Colombia provide a stunning backdrop. Cycling fans went wild when these videos on Froome’s Instagram account were beamed to his 910,000 followers last week. Froome on the gravel with his time trial bike — the video generated plenty of online chatter. Those images came from an actual training ride that Froome completed during his build-up for this week’s Colombia 2.1 stage race, which kicked off Tuesday in Medellin. On his way up this road, which was much rougher than anticipated, Froome was surprised to hear a man calling out to him from a farm in the hills. Those images were captured in a recent Sky video, called “Inside Line,” which chronicled the team’s pre-race training in Colombia. Froome’s international star power has reached well into South America. And despite the local partisans’ deep support for Colombian riders such as Nairo Quintana and Rigoberto Urán, they are just as happy to see their riders’ British nemesis. His Colombian teammate Egan Bernal, winner of Colombia Oro y Paz last year, the precursor to Colombia 2.1, was unsure how his countrymen would react when Froome arrived at their country’s biggest cycling race. Froome also had some reservations, given that on three occasions, he’s won the Tour de France right ahead of a Colombian star. “I was a little bit apprehensive coming here. I could understand if they see me as the bad guy, the guy who’s going up against local heroes like Rigoberto Urán, Nairo Quintana,” Froome said. 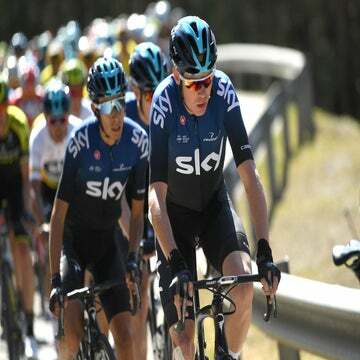 In fact, Team Sky boss David Brailsford said the race organizers and Colombian federation president asked him to bring Froome for the 2019 race. The locals might even love Froome a bit too much. Sometimes European pro cyclists can blend in while visiting a country outside their sport’s traditional heartlands. Not in Colombia. Froome says he’s been mobbed by fans wherever he goes.